This is great information from them...wow. When you find that Googler to hug, give them one for me. I can see I will be digging around in this data for a few days now - still a little hesitant to start putting WT on every site, but glad I have it on one of the main money sites. Pity the historical data doesn't go back too far yet - but the data it has is enlightening. Seriously, though, I was playing around with the new functionality this morning and coming to the same conclusions. Really a home run from Google here. My data isn't entirely scientific, but I definitely see that behavior depends on horizontals and verticals. I'm aware of one domain where Google's results are just awful (compared to user desires) and users have been trained to click on links further down the page and ... GASP ... even click through to 2nd, 3rd, 4th and further result pages. 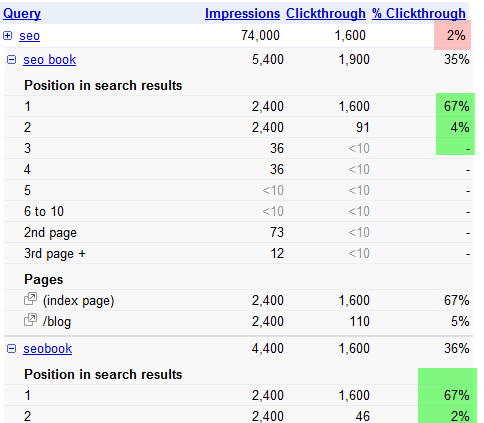 If you have an indented listing, Google counts them separately and doubles your impressions. This is valid data and probably the only way to handle it, but if you are showing a double listing, be sure to divide the total impressions by 2 to understand your CTR for a given keyword. Yup...and the core CTR is shown as 1/2 of what it would be if you added up the individual numbers. I was surprised to see that we had a non-branded keyword where a double listing with sitelinks pulled in nearly a 90% CTR, at least according to their data when you add up the individual pieces. 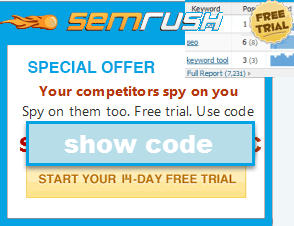 Now if they would link that to Analytics/Adsense that would be really cool. Of course I can do it on my own, but you know for simplicity sakes. I say that because the "data" shows a phrase that isn't worth the bytes its stored in, but yet it actually pays pretty well. Of course that also means you have to look below the surface. I sort of like this feature but am feeling stupid these days so can't really work out how to use them properly. Anyone got any (simple) ideas? The new reporting looks very nice, indeed. Well first of all, this is probably my favorite post ever. Great job. I still call BS on #1 getting 42.13 percent of shared info. What does that mean anyways? I'm just not buying it when #1 can likely be 2 scrolls down the page these days with the way maps, local, ppc, video, etc. are being pushed. Most importantly, what does this mean for clicks? And since i can hit he AOL building with a 7 iron form my office, and considering how they should be ruling the world by now, i simply don't trust them. The wrong brand keywords section is fascinating. You always impress the heck out of me Aaron. That 42% was *before* Google rolled out all the one-box results & universal search features. Also some searches are navigational and get a 90%+ CTR on the top result...so that helps offset a bit the informational searches which might typically get a lower CTR. Thanks Aaron! This is some great data. I've been looking over my website and my clients - mainly looking at the impressions. See you can setup custom Google Analytics graphs/charts to show you how many clicks come from which keyword and to what pages but knowing how many impression you got was a bit tough. I would usually use Google's Adwords keyword tool to determine this or data from an actual Adwords campaign but this is great. I just really hope this data is real. I'm going to do a study on one of my own websites and see if the data actually matches up - Google's Adwords keyword tool VS the Webmaster Tools data. I'll let you know my findings. The data might be just as real as any, but scrub out duplicate visitors which are not scrubbed out in Google analytics or some such. And even if there is a bit of a data parallax issue, you can still easily account for it by tying together multiple Excel spreadsheets of data. It just seems like the data is off too much after looking over my study. Also as the impression numbers get larger the data seems to be off more and more at a greater amount. I also did the study on a few other domains than what I put on my blog but I got the same results. The only thing I could see is that the analytics data just is not true or the averaging (since it's an average of past months) is throwing it off. And for the analytics data it could be duplicate visitors but I've tested analytics verse other visitor tracking software and it seems to be pretty accurate - even when I used other software which showed me the IP address of the visitors so I could really tell if there were any dups. Although that was quite a while ago I did that study - some years ago. Any thoughts? Thanks for your input and time. Aaron, Have You Tried This Tool? Aaron - a bit off topic, but wondering if you have seen our new Google Suggest keyword research tool? 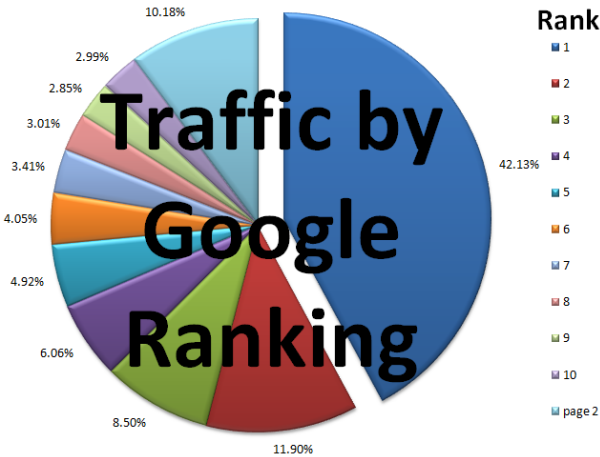 http://www.spartanburgseo.com/2011/11/20/seo-service-in-spartanburg-sout.... I just published it, but I'll be upgrading it with a premium theme shortly. I'll be happy to alter it in any way. Just let me know. Otherwise, if it's okay, I'll proudly display it as I'm an SeoBook fan. I love this illustration because it makes it so easy to see the critical importance of ranking in the search engines. It so clearly shows that about 97% of traffic from a Google search goes to the first page...especially above the fold. A Cheap Thrill or a Lasting Memory... Who Will Remember You?